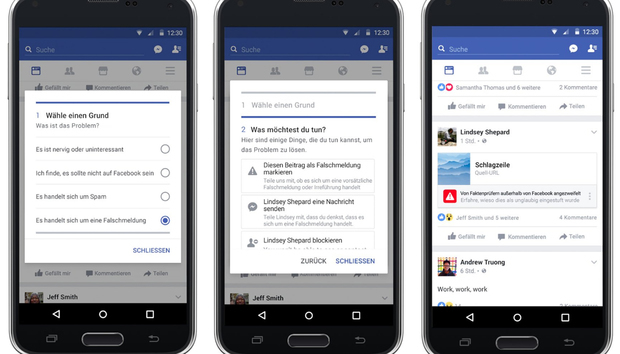 Facebook plans to deploy a tool to deal with fake news in Germany in the coming weeks, after announcing tests of the tool last month. The move comes after reports that some German politicians wanted to impose fines of thousands of euros for each fake news story disseminated. The process of identifying fake news will typically begin with a report from a Facebook user. The company is making it easier to report fake news, it said Sunday: Users need only click on the upper right corner of a post to file a report. Such reports, and other warning signs identified by Facebook, will result in the suspect news report being forwarded to a team of fact-checkers working outside the company. The company has been seeking fact-checking partners since last November. The fact-checkers it works with now have all signed up to the code of principles disseminated by the International Fact-Checking Network (IFCN) at the Poynter Institute, a Florida-based training center for journalists, Facebook said Sunday. In Germany, it will work initially work with Correctiv, and hopes to work with other media organizations too. Last week Facebook announced a broader campaign to woo journalists. If one of Faebook's fact-checking partners considers a news report to be fake, then the report will be displayed on the site with a label identifying it as untrustworthy. Facebook won't stop people sharing such reports, but it will display the warning alongside them, including a link explaining why the warning is attached to that story. While some fake news stories are disseminated to influence debate, others are circulated to make money. Facebook is cracking down on spammers pretending to be reputable news agencies in order to drive visitors to their sites. There's still work to be done on the tool being introduced in Germany, but Facebook intends to put it to work stopping the spread of fake news in other countries too.